George St. Pierre vs. Anderson Silva | MMA Fighting Events Videos Techniques UFC Fight Picks and News. Be careful what you wish for, you might just get it. Every time I finish cutting weight for a fight, I wish for the all you can eat buffet. Yes, I do get it, and yes, I do pay for it. 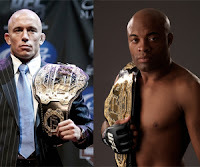 We UFC and MMA fans have been crossing our fingers and holding our breath, wishing to see Georges "Rush" St. Pierre exchange chingasos with Anderson "The Spider" Silva in a UFC fight main event super fight. We UFC fans envision the most epic battle in the history of epic battles. We envision Superman versus Batman, Flash versus Spiderman, Ironman versus Captain America, or even our looney left-wing aunt versus our nutjob right-wing uncle. When we think about Rush versus The Spider, we envision K1 type striking, D1 level wrestling, Abu Dhabi style submission attempts and reversals. I really wish to see this battle, I really, really do. Please Mr. White! Can we all see this fight? Pleeeeease! We’ll even finish all our nachos and drink all our beer at the next UFC event. If Dana comes through and we get our wish, will this be what we actually get? I won’t keep my hopes up too high. I think an epic battle is more a figment of our MMA imagination. I can’t be the only one that remembers Arlovski vs. Sylvia III. I can’t be the only one who remembers what happened when 2 UFC stars went out in hopes of not losing rather than snatching a win. GSP just finished going five rounds against a fighter he clearly outclassed in the standup, Jake Shields. GSP broke Josh Koscheck’s eye, but still could not finish him. GSP dominated Dan Hardy, Thiago Alves, and Jon Fitch yet these fights all went the distance. In his last 6 fights, Rush was only able to finish BJ Penn. It took him 4 rounds to finish a fighter that is almost known as much for gassing as he is known for his fighting prowess. Then there is The Spider. The Spider had devastating one-chingaso knockouts of Vitor Belfort and Forrest Griffin. He danced around a bit for both fights, but in the end, he made both of them look silly. Nevertheless, we can’t forget the dancing and back peddling. Then, what happened with Demian Maia and Patrick Cote? The Spider was more like Bozo the Salsa King. He danced and pranced and lost many fans because of his clown act. So, what will happen when Rush versus The Spider finally happens? 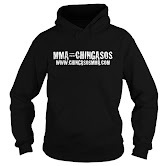 That’s the great thing about MMA, nobody knows. It might turn out that St. Pierre comes out and goes for the finish. It might turn out that the Spider comes out aggressive and doesn’t just wait to counter punch. St. Pierre and Anderson might put all their talents on display and have the most epic battle in UFC history. I might see all the lotto numbers in my dreams and tell my boss to go to hell. All these things might happen, but that’s not what history tells us. Like most UFC fans, I’ll keep on wishing for the fight(and playing the lotto). But, we all must be careful what we wish for or we might pay for it with another epic dud.